Windows 98 and Me are no longer being supported. If you're having problems it might be time to upgrade. Perhaps even if you're not having problems. Windows XP and its successor Windows Vista represent significant improvements over Windows 98 and Windows Me (herein after referred to together as "Windows 9x"). Without getting into horribly technical details, Windows 9x was fundamentally based on the evolution of the older MS-DOS operating system which was never really intended to do all the things that Windows ended up doing. Windows XP, on the other hand, is based in Windows NT technology which was written from scratch as a more secure, more stable and ultimately full-featured operating system. As of July 2006 Microsoft has completely dropped all support for Windows 9x. While somewhat controversial, in my opinion it's unreasonable to expect any company to support all of their products forever. You can argue over the timing perhaps still being too short, or even question Microsoft's motives, but the fact is that support was going to be terminated some day. "I strongly encourage every one still running Windows 9x to consider upgrading to something else." And, again in my opinion, doing this sooner rather than later was a good move, if only to encourage more people to move to more stable and secure platforms - be it Windows XP or even the non-Windows alternatives. Windows 9x is showing its age, and due to its various issues, was more of a liability to more users than it was worth. So in case you haven't gathered by now, with a couple of exceptions, I strongly encourage every one still running Windows 9x to consider upgrading to something else. Particularly because newly found bugs and vulnerabilities are no longer being fixed in those platforms, continuing to use them presents a real security and stability threat. Naturally Windows XP would be the most comfortable upgrade for most people, however if it meets your needs, switching to Linux would probably allow you to extend the life of your older hardware that might not be powerful enough for XP's higher requirements. Alternately, if you are about to upgrade or replace your hardware as well, it'd be a fine time to understand whether a Mac might be right for you. Cost. I don't want to minimize the fact that not everyone can simply afford to upgrade. Clearly there is a risk/cost tradeoff here, and if cost is truly a serious factor I'd revisit the applicability of free Linux alternatives. 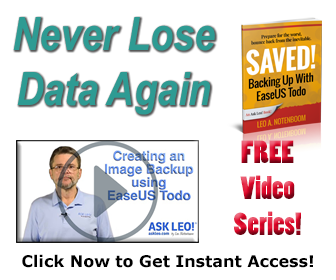 Perform a full backup of your entire machine. Update anything that can still be updated. Make absolutely sure you were behind a hardware firewall such as a router. Make sure you find anti-virus and anti-spyware utilities that still support Windows 9x and are being updated regularly. But I'd definitely prioritize upgrading when you can. When the time does come to upgrade, how your existing files and folders are handled will depend on how you upgrade. Again, I always suggest a full backup so that no matter what happens the files are preserved somewhere. If you upgrade your existing machine, assuming your hardware meets the minimum requirements for XP or Vista, then your files and settings should be preserved as best they can be. If you buy a new machine, I'd actually recommend installing your old hard drive into the new machine as a secondary drive, so that you can copy off files as you need them. Ask Leo! - Can I revert from Windows XP and NTFS to Windows 98? Ask Leo! - Vista, or not? Ask Leo! - Should I Install Windows XP SP3? Or if the equipment's as old as the OS, they may want to switch to Linux. Yes, Greg, he mentioned that in the article. Twice. I have never had a new computer in my life, can't afford one. But I have had a few over the years. All second hand. Bottom line here is that not everyone can rush out and buy a new system (or for that matter upgrade) evertime Microsoft decides to shove a new operating system in your face. My first computer with XP was only a P2-266 mhz, with 64mb RAM. I couldn't put the SP2 updates on because it bogged down my system to much. I also had to turn of the fancy graphics and used programs like 'XPLite' (http://www.litepc.com/) to trim down some of the Fat. I got lucky at a yard sale recently and now I have a P2-400mhz computer with 192mb RAM. From my experience, its not always a matter of 'Should you...' but also a matter of 'If you can..'. Microsoft were developing an operating system (beta codenamed Neptune) based on the Windows NT 5 platform in 2000 when they realised that XP was going to be ready first and superceed Neptune before they had a chance to release it, so they abandoned Neptune and released ME instead, but it was not because of a delay in XP. XP was always coming, just that Neptune was supposed to preceed it for the Home user versions. Leo! Your telling this guy to do a lot of stuff someone who's still running WINDOWS ME to do! There's no way he can figure out how to install a second hard drive, much less backing up and reformatting. Computer hardware prices have fallen considerably in real terms since the days of Windows 9x, so the cost of upgrading both hardware and software may be less than you think. It really isn't worth trying to keep old, out of date software running once it's no longer supported, and if the hardware is that old, it's probably going to start developing faults sooner rather than later. Remember that there are thousands of hours of development work that have gone into new software, and all this can be of benefit to you and your business at a relatively low cost. You are wasting your time and money by trying to work with a system that has passed its 'sell-by' date! If your machine meets the minimum requirements for XP, then backup your machine, purchase a copy of XP and boot from the XP setup CD.